737 WALNUT GAVEL WITH SOUNDING BLOCK. 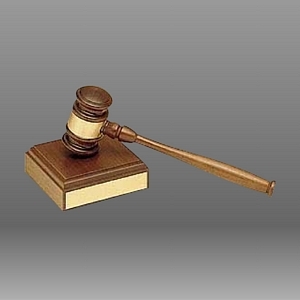 THE GAVEL IS AVAILABLE IN 2 SIZES AND EITHER SIZE CAN BE PURCHASED WITH OR WITHOUT THE SOUNDING BLOCK. THE BAND ON THE GAVEL AND THE PLATE ON THE BASE CAN BOTH BE ENGRAVED.